Seattle City Councilmember Kshama Sawant, along with the growing housing justice movement, won an important victory this week. Carl Haglund, a landlord and developer in Seattle, decided to withdraw his defamation suit against her and the City of Seattle. It was clear from the beginning that Haglund’s defamation suit was motivated more by political than legal considerations. The real purpose was to retaliate against the successful efforts of his tenants, Sawant, and the wider housing justice movement after they scored important victories for renters’ rights. Haglund has repeatedly used defamation suits to intimidate tenants and anyone who has stood up to him. What is already clear is that even after winning in court the damage done by this lawsuit could be ongoing, creating a chilling effect on tenants and housing rights activists. If you have been paying attention to The Seattle Times coverage of this lawsuit, you know that because of Haglund’s abuse of our legal system the city has paid a large sum in legal fees to defend this suit. See the Seattle Times headline: “Seattle has spent $258,752.78 so far, gets partial win in 1 Sawant suit.” The Seattle Times has repeatedly tried to place the blame on Sawant for having a meritless lawsuit filed against her. Unfortunately, the attorneys for the city agreed to forgo any claims for the collection of attorney’s fees from Haglund and in exchange agreed to dismiss his defamation claims and end this lawsuit. While obligated to defend Sawant legally, Mayor Durkin and the city attorneys have zero interest in defending her politically. We would challenge the Seattle Times’ narrative. The story here is one of a landlord who acts with such impunity that, it seems, he believes the laws designed to ensure families live in habitable conditions simply do not apply to him. At the same time, Haglund is more than willing to misuse our legal system to attack any critics of his practices. Now Haglund has cost Seattle taxpayers more than $250,000, but he will get off without having to repay one dime. Haglund is no stranger to the defamation suit game. He has repeatedly brought defamation suits against tenants who dared to write negative Yelp reviews about him. These suits are quickly thrown out as frivolous when tenants are fortunate enough to have the means to challenge them. However, challenging a lawsuit is expensive and time intensive. At least one tenant was apparently coerced into writing a retraction of his negative review. Threatening to sue a tenant for defamation is bad, but Haglund does not stop there. Last summer, a Pierce County court ordered Haglund to repay a building owner $1.1 million in damages after Haglund himself deliberately cut holes in drywall ceilings and surgically cut wiring throughout a building for sale in order to reduce the purchase price. The lawsuit against Sawant arose from Haglund’s failed attempt at exploiting and intimidating two tenants. In 2015, Haglund tenants Osman Osman and Sahro Farah, from a Columbia City property known as the Charles Street apartments, bravely came forward to protest rent gauging and deplorable conditions. Haglund was planning on raising the rent as much as 100 percent despite the fact that there were numerous tenants living with rats, roaches, and a lack of heat. City inspectors subsequently entered the building and cited Haglund for 225 code violations. Osman and Farah decided to fight back. They reached out to Sawant’s office, who helped to organize the tenants for a public fightback against the rent hikes and code violations. After the media attention on the Charles Street apartments, Haglund personally came to the doors of Osman and Farah in an attempt to intimidate them. In response to these events, tenants, Socialist Alternative, and members of the wider housing justice movement worked closely with Sawant and her colleague, Nick Licata, to propose a new law that bans increases in rent for buildings with numerous code violations. This law became known as the “Carl Haglund Law,” and the City Council voted unanimously in support of it. Subsequently, Haglund filed his lawsuit against Sawant and the city for referring to him as a “notorious slumlord.” Haglund claimed Sawant illegally used his name, defamed him, discriminated against him, and inflicted emotional distress upon him. City attorneys prepared to defend the defamation claim by submitting evidence to prove that Haglund is actually a “notorious slumlord.” Numerous declarations from staff at the Tenants Union, tenants of Haglund, Sawant, and even a damming email from a former city inspector outlined Haglund’s extensive history or preying on immigrant and refugee tenant communities while evading the city housing ordinances. This lawsuit was never really about Haglund being defamed. We believe this lawsuit has been Haglund’s attempt to use the legal system to intimidate and quell the growing housing justice movement by attacking one of its most prominent voices. Sawant has been at the forefront of a movement to curb Seattle’s housing crises. Alongside tenants, Sawant helped defeat a 400 percent rent increase in public housing that would have disproportionately impacted people of color. Furthermore, she helped lead a broad coalition of forces that won a tax on Amazon and other big businesses to build affordable housing, and she consistently has called on the city to stop the sweeps of homeless encampments. The aim of this defamation suit, regardless of the outcome in court, was to damage Sawant in the court of public opinion. If successful, this attack would have sent a clear message to anyone else who dared to speak out. Importantly, Haglund is not the only actor to use the defamation lawsuit as an attack on social movements. The two Seattle Police Department Officers who gunned down Che Taylor, a black man attempting to comply with orders when he was killed, are also suing Sawant for defamation. 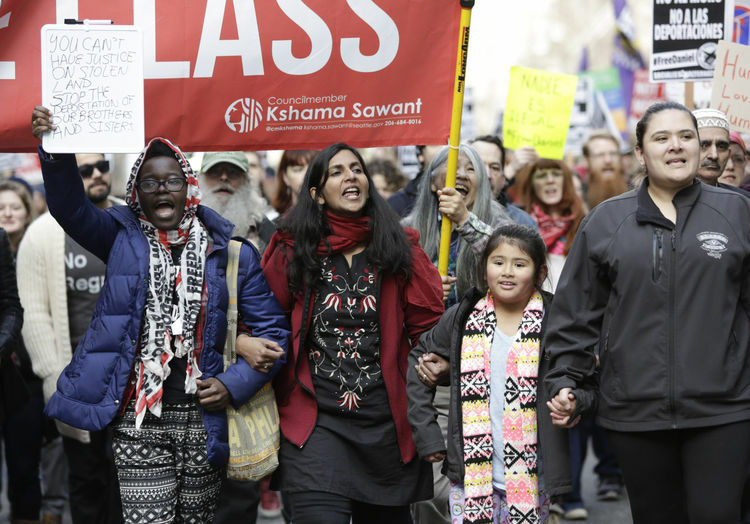 The 2016 killing sparked a wave of protests against police racism, where Sawant spoke out against the abusive action and the legacy of racist violence by police. This use of such legal processes is clearly intended to silence and intimidate not only Sawant, but all movements of oppressed communities, people of color, and campaigns that demand justice and equality. The right wing, big business, and the establishment are furious at the growth of protest movements and are eager to retaliate against figures like Sawant publically. This tactic also fits within the wider right-wing agenda of Trump and Republicans who are supporting legislation criminalizing dissent. There have been various bills brought forward around the country, in the wake of Black Lives Matter protests, imposing draconian penalties for different types of protest. To survive these attacks, we must change how this story is told. Kshama Sawant is one of very few political representatives who consistently demand developers and police be held accountable. Few others have used their positions to challenge the power of developers and the establishment through building movements alongside oppressed and working people. Instead of blaming Sawant for being sued, we should be blaming those who willfully disregard the laws designed to protect tenants from deplorable housing conditions. We should be blaming a corrupt criminal justice system that is more interested in indicting activists than cops who kill. And we should demand Haglund repay the $250,000 he cost our city so we can use the money to fund affordable housing programs. To successfully change the narrative, we need to build a powerful movement to stand in solidarity with Sawant and others against intimidation and harassment. The potential exists to turn the tables on these right-wing attacks with a powerful campaign of popular resistance. To do so, we have launched the Kshama Solidarity Campaign to make clear that our movement will not be silenced. This campaign is not about defending Sawant as an individual. It is about defending the rights of all those who speak against housing exploitation, racism, and police brutality. We want to make clear that we will not be intimidated and that we will continue to fight for a strong and unbowed movement. We are appealing to all community groups and individuals who believe we need a strong and unbowed movement against police intimidation, racism, exploitative landlords, and the whole political establishment to stand with us. Join us for our launch event on June 23rd from 7 PM to 10 PM at Washington Hall, where we will host an evening of live music, food, and speakers to celebrate the launch of our campaign and help everyone learn how they can get involved. We must demonstrate decisively that attempts to silence voices of dissent like Sawant’s will be met with a powerful resistance and that we have each other’s backs! Please consider donating to our solidarity fund to help cover the costs of our launch and future campaign events.